We often make something along the lines of a tortilla/frittata/omelette for lunch. I fry whatever I happen to have (often leftover potatoes, but not this time), then add eggs and maybe some cheese. Good food, for the whole family. a handful grated cheese, preferrably sharp. I used the Dutch Primadonna. Dice the bacon and the onion. Fry, with the corn, on medium heat until the bacon becomes crispy and gets some color. Whisk the eggs with water, and some salt and pepper. Add this to the frying pan, and stir the edges towards the middle as they start to set. 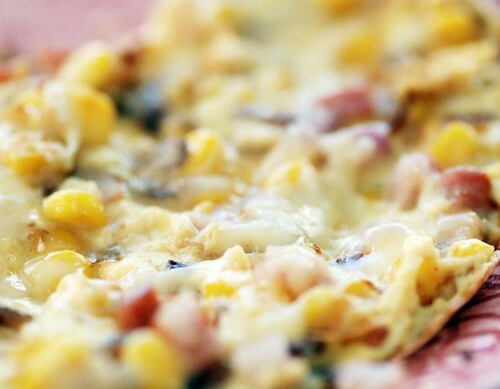 When most of the omelette has set, add the cheese and let the omelette finish for a few minutes on medium-low heat. Mmm this looks and sounds delicious! !